Could any brits tell me roughly how much that might cost? I'm considering a blown-up speech bubble from Watchmen. Perhaps 'Who makes the world' with the dot-screen etc, similar to the frontispiece of the 'Who Watches The Watchmen' book. "Because there is good and there is evil, and evil must be punished. Even in the face of Armageddon I shall not compromise in this." Yeah, but you're in wales! Thats unfair. It can't be too hard to get to the capital city of Wales. Cardiff has it's own airport after all! Last edited by 023 on Fri Aug 21, 2009 7:30 am, edited 1 time in total. Thanks to Lord Ruthven for posting that photoshopped image -I've wanted this done for a long time, I'm not a bad artist but I could never copy the symbol to a quality I was happy with. Where are you planning to haing the window panel tattoo done? I'm looking at getting it at on the top section of my inner left forearm. I already have a smallish tatt towards my wrist, but it leaves me with just the right amount of space to get almost the whole vertical length of the pic without losing the scale. I will cut off the majority of the right hand of the panel so horizontally it will run from just before the left window pane edge to approx the fourth window across on the skyrise to the right. 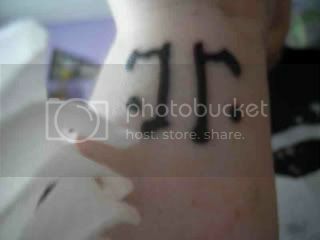 I got the same tattoo as the guy with the previous picture just the other day when i was coming back from college. I wanted to get rorshachs signiature on me for a while but i spontaneriously decided to go get it done on thursday. rachtheweevil how much did yours cost? Mine is the same design but smaller. Mine was £30 although depending on where you go I saw someone mention they got it for £15! Worth every penny though, and the tattooist said he'd touch it up for free if I didn't think it was dark enough in a couple of weeks, which is cool. What are you talking about? Don't you all live in caves and hovels in the valleys? 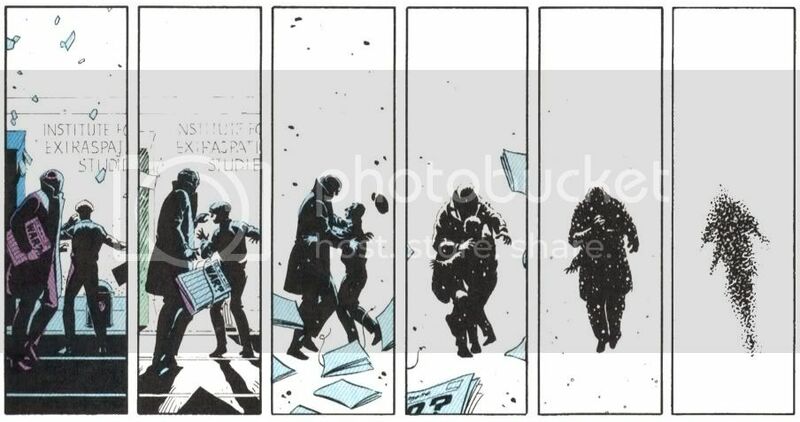 I have been thinking of tattoos for a bit now and I think, if I were to get a Watchmen tattoo, it would have to be the image of Bernard and Bernie hugging as they die. That one moment just complete sumarizes everything the GN has to tell us. That one image means so much to me. Actually, does anyone have a scan of that image? I haven't been able to find it anywhere, and I can't get a scan from my copy. The tattoos you guys have here are brilliant! Who was the one that is getting the giant squid panel done? When will it be done? I would so appreciate it, if you would! Another tattoo I would get is the vivarium smear posted a few pages back. I would get that done on my inner forearm.